I was browsing Pinterest when I saw this photograph that immediately caught my eye. 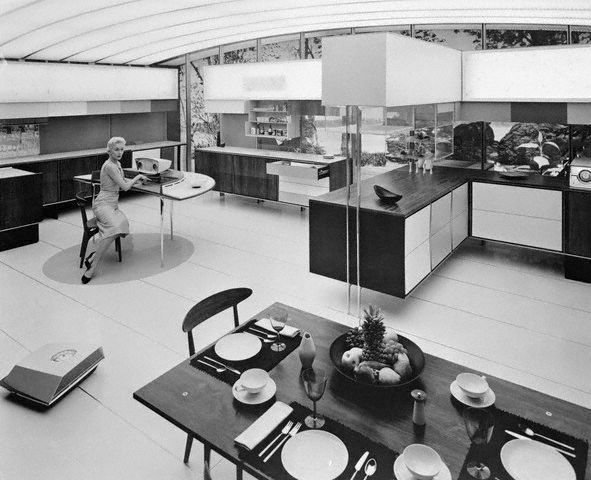 I’m obsessed with retrofuturist predictions about homes, especially kitchens. 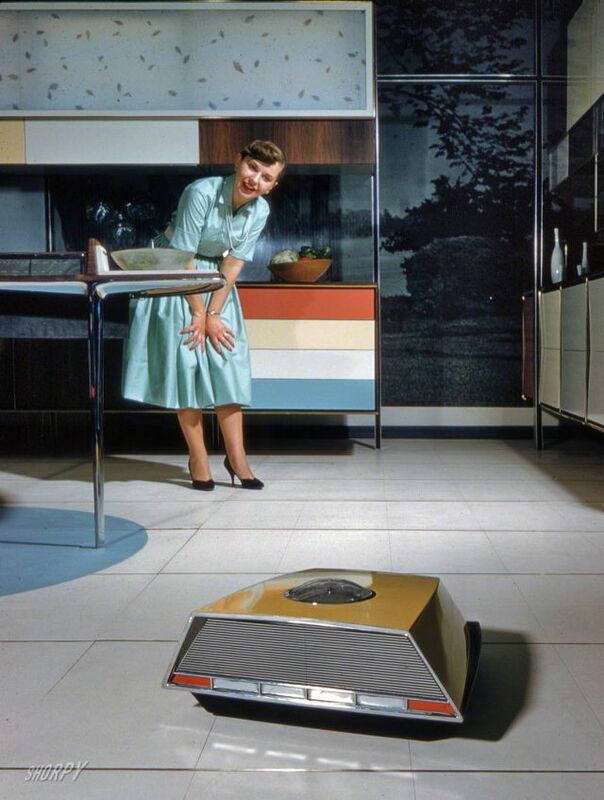 In the 1950s and 60s, kitchens were still considered “the woman’s domain,” and most of the technology predicted for women was in this arena. We’ve often seen the smart kitchen with computers managing diet and perfectly prepared food emerging from hidden appliances. 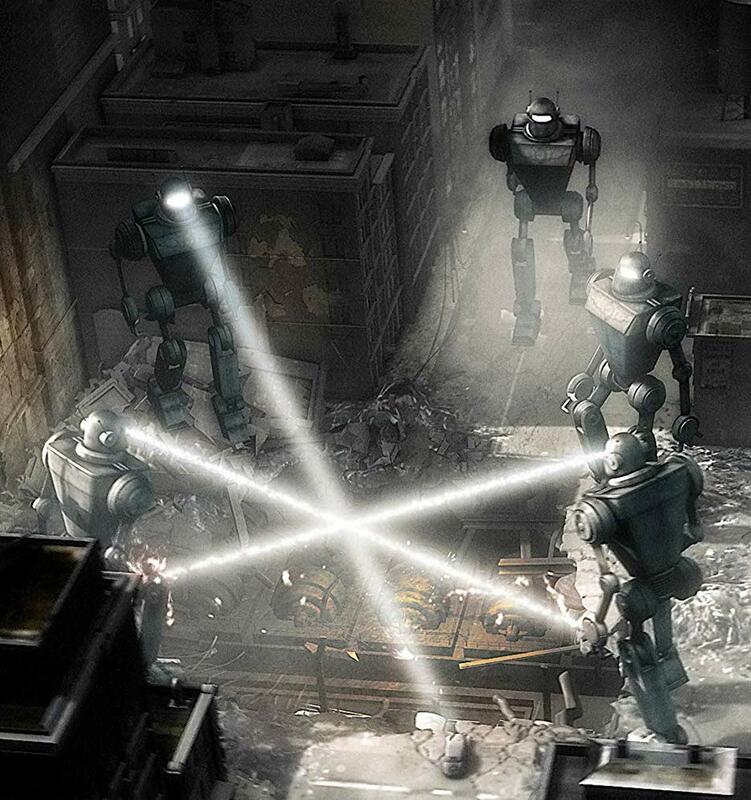 But rarely do we see what amazing technological predictions they had for cleaning the floor. 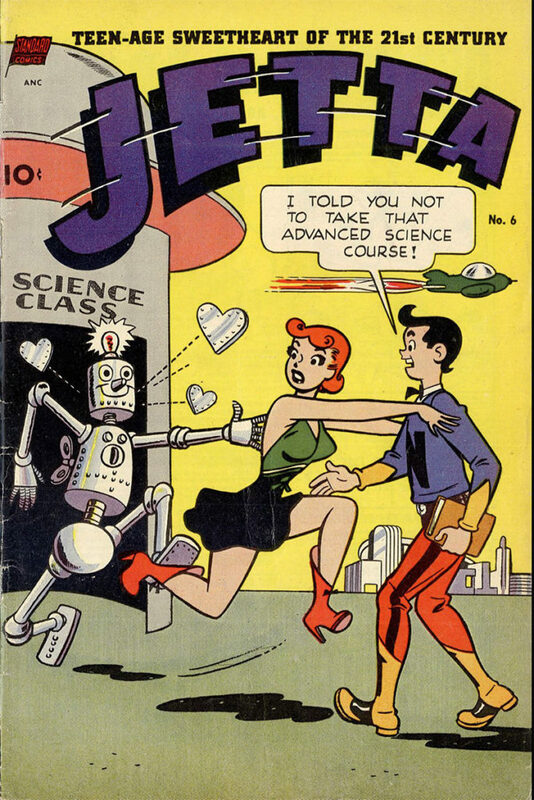 So this was a little more than a prediction, more like an invention that was ahead of its time. This robot floor cleaner was patented in 1957 by Donald G Moore. Controlled by a central console, you only need to press a button and the little robot appears and buzzes around just like the Roomba. It uses similar sensor technology and follows a preprogrammed path around the room so that the entire room is cleaned. One way it differs from the the Roombas on the market today, is one floor unit both vacuums and “mops.” Also, the design on the original is charming but very dated. Check out the whole kitchen in action in this promotional film. The robot floor cleaner appears at 11:50. The center of the kitchen is a Home Electronic Center Kid (called HECK) that allows you to monitor and run the whole house by push button, including the robot floor cleaner. Thanks to NEST, smart light bulbs and appliances, and Apple’s HomeKit, we’re getting closer to being able to control our house from our smartphones. Overall, this is a very cool prediction come true to look back on today. The thing about dealing with predicting the future is that, at some point, the future happens and then we get to look back at everyone who was laughably wrong.